Whether you meet in a live group, or meet via teleconferencing or video chat, getting your mastermind group together for a 3-day Retreat Weekend will change the complexion of your group forever. Each year, many of my telephone-based mastermind groups get together for a three-day Mastermind Group Retreat Weekend, typically starting early on Friday morning and running until lunchtime on Sunday. 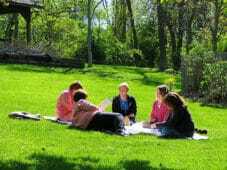 The purpose of our annual Retreat Weekend is to create a focus and a plan for the coming year. The group in the photo had been meeting via teleconferencing every month for 4 years but had never met in person. Some members have left and new ones have joined the group, but the core has stayed steady. After four years of meeting together monthly on the phone, we decided to finally meet in person. The energy was amazing! We had gotten to know each other in small time segments, 90 minutes at a time, during our monthly teleconferences. Spending three days together took our mastermind group to an entirely different level. Friday morning: Everyone arrives at 9:00 AM; coffee, tea and conversation for one hour. Friday morning/afternoon and Saturday morning: in-depth masterminding (one hour per member), setting one-year goals, choosing yearly intentions/themese, discussing what might hold us back. Saturday afternoon: success exercise (for example, doing a Vision Board together), and setting 90-day goals. Saturday night: BBQ picnic and bonfire — including burning of pieces of paper where we wrote the things we wanted to let go of in the coming year. Sunday morning: presentations/training by group members on specific topics of interest. Each group member gave a 20-minute presentation on a topic that they were an expert in or a topic that they were studying. As you can see, a Retreat Weekend gives you a chance to mastermind to a level that you can’t do in shorter meetings. It also gives your members a chance to socialize, building stronger bonds with each other. Thank you. I actually think that I can start with this for my mastermind group.